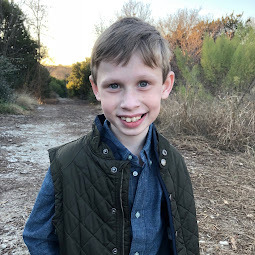 Bennett Brinson Gamel: Fighting Cystic Fibrosis: Not ok.
Grief is hard. I have wondered how to deal with Bennett's grief in this situation. Outside of the hospital, Bennett sees a play therapist regularly to help him cope with the losses and disappointments cystic fibrosis regularly brings to him. 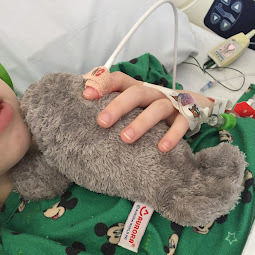 But in the hospital it's been my and Brian's job to help him grieve and work through what has turned out to be a painful experience for a 6 year old to have to endure. 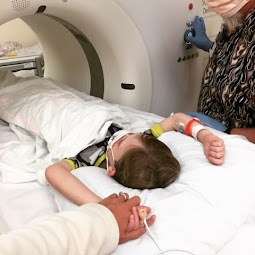 At midnight last night, when we learned Bennett would need to get a new IV in his hand - a third needle poke in 48 hours, I asked the nurse to take his old IV out and to just give us time to process what was about to happen. I was prepared for Bennett to freak out. But he didn't. He just resigned himself to what was about to happen. I reassured him I would hold his hand and sing to him again. But I could see Bennett was terribly sad. I climbed up in bed next to him, gathered his hand into mine and I said: "Bennett, none of this is ok."
Bennett's bottom lip curled tenderly and he began to cry. I continued, "your being in the hospital is not ok. Your having to get another IV in your hand is not ok. Your hurting in your belly is not ok. Your rectal prolapse is not ok."
Bennett muttered, "surgery is not ok."
I said, "yes. It's not ok we can't go home." He said, "it's not ok I can't go to school." I said, "it's not ok that you were itchy and they couldn't get it to stop." He said, "it's not ok that people keep bothering us." Then, Bennett saw me wiping away a tear. "You're crying," he asked and stated at the same time. Moms don't usually cry. I wasn't sure it was best to let him see me cry. But, in this moment, I felt he needed to know I was in the same place he was emotionally. I wanted him to know he isn't alone in his tears. I said, "yes, I am crying because this isn't ok with me either. I don't like this. I don't think it's ok for you to hurt. I'm your mom. Your my baby. When you hurt, I hurt." We sat in silent for a few minutes. Then I said, "You know, Bennett, even though a lot of this is not ok. There are some things that are ok, right? Can you think of any things?" Without missing a beat, Bennett answered, "you." My face lit up. I turned towards him, "does it help you that mommy is here?" He nodded, "you help me." I snuggled back down against the white sheets on the bed beside him and said, "I feel the same way. It's ok that we get to be together. I like being with you." We laid there for a few minutes staring at the myriad of "get well" cards taped to the wall in front of us. "Is it ok that your friends colored you get-well cards and thought about you when they did them? Is that ok?" I asked. "Is it ok that you have some really cool balloons to look at while you lay here?" I wanted to tell him that more than 400 people have shared with us in some way via Facebok they are praying for him, thinking about him or rooting him. I wanted to explain to him the significance of the gift that we have received of people from all over the United States taking pictures of themselves wearing Bennett's tshirt and using the hashtag #initforbennett. But I knew there wasn't easily a way to explain this to a 6 year old who is not on social media. So, I tried to explain how lucky we are to be surrounded by a loving community by starting with the community he knows. 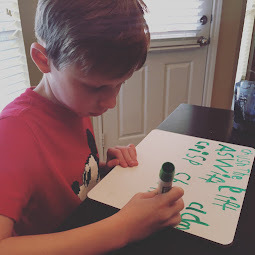 I asked, "Is it ok that Nana and Papa and Mumsy and Pops want you to get better?" "And, is it ok that Aunt Brooklyn and Mango, the dog, want you to get better?...and Uncle JC and Uncle Barrett?...Uncle David and Aunt Blair?" Bennett jumped in, "...and my godparents?!" "Yes," I smiled. "...and our babysitter, Peyton?" "And Grandmom, who died and is gone to heaven?" 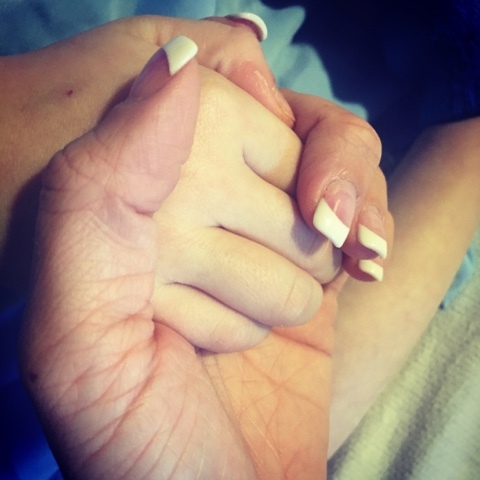 "You bet," I grinned, "It's definitely ok that Grandmom in heaven wants you to get better." "And God? And Jesus?...And that lady that does your hair?" We were on a roll and I could tell his spirits were being lifted as he thought of the people he know who love him. I said, "all those things make me happy." He agreed but then looked down and said, "but I still feel sad." I said, "I know. I think I feel both at the same time. I can feel happy and sad." Bennett replied, "That's ok. It's called, 'happy-sad.'" After our conversation, I suggested we take a break from feeling sad and use our last few minutes before the nurse came in to feel happy. So I grabbed his iPad and we watch funny cat videos and videos of babies giggling. It helped us both to laugh. Bennett ended up doing an amazing job getting his IV. I rubbed his forehead and sang his favorite songs. He got a new sock on his arm. And we both felt happy-sad. And Sophia wants Bennett to feel better, too, really soon! All of us on the C3N team do. Thank you for sharing. You write from your heart and it is so moving. It made me happy-sad. Will continue to hold all of you in my prayers. This post has me (and I'm sure many others) in tears. Breck, I cannot imagine the strength that it is taking to get through each moment right now. I am on my knees praying for you all and will not stop. May God bring rest, peace, comfort, and hope during this time of uncertainty and unfairness. Acknowledging sad is so important. You were brilliant to know that and this can be a template for others of us. Has you seen 'inside out' where the sad character has an important role?